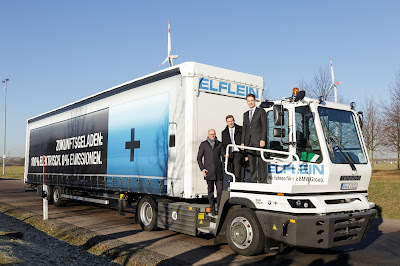 BMW and transport and logistics service provider Elflein today put a battery-powered truck into operation in Leipzig. The BMW Group is the first automotive manufacturer in Europe to use a 40-tonne electric truck for material transports on public roads since 2015 to supply the Munich plant. Following this successful pilot phase, the next phase will be followed by the commissioning of an electric truck for the Leipzig plant. The vehicle built by Dutch manufacturer Terberg is used by the logistics service provider Elflein and commutes daily in the two-shift operation over a 5 kilometer distant between logistics center and the BMW group factory in Leipzig. Different vehicle components are transported, which are required for the assembly of the BMW i3 and the BMW i8 plug-in hybrid car. The electric truck is charged exclusively with electricity from renewable sources. Compared to a diesel-engined truck, the electric truck will save up to 21 tonnes of CO2 annually. Charging the truck battery takes three hours. Fully charged, the vehicle has a range of up to 80 kilometers. This means that the electric truck can complete a complete production day without additional charging. "With our electric car BMW i3, we not only pay attention to the product, but have also aligned the entire value chain to environmental protection and sustainability right from the start. For example, we need 70% less water, 50% less energy, and 100% renewable resources to produce a BMW i3 compared to a conventional vehicle. That is why it is only logical that we now also rely on emission-free trucks in logistics and transport, "said Markus Grüneisl, Head of Logistics and Production Control at the BMW Group's Leipzig plant.